Quick and easy Sugared Cranberries make a beautiful garnish on cakes, pies, or cocktails and make a delicious sweet treat for your holiday celebrations! I’m not a cranberry sauce fan. At least not yet. Are you? I’ve not found or created a recipe that’s wowed me. Sugared Cranberries on the other hand, I adore. When I first made Sugared Cranberries, I was so surprised how quickly they come together and how much I loved them given my cranberry sauce aversion. Pop em’ in your mouth. Garnish a cocktail, may I suggest this one, top a cake or cupcake… sweet potato mash or pie. Offer them as a snack at a party. They make tasty gifts too. A quick (hands on time) and easy recipe that’s so impressive during the holidays. And just look at that color! They’re sweet and sour, but balanced. The cranberry pops under the pressure of a bite, an exhilarating sensation I might add, then sweetness kicks in leaving a bold experience of both sweet and sour. Can cranberry sauce do that? Make a 1/2 batch, full, double or triple based on needs. Your family and guests will appreciate them. 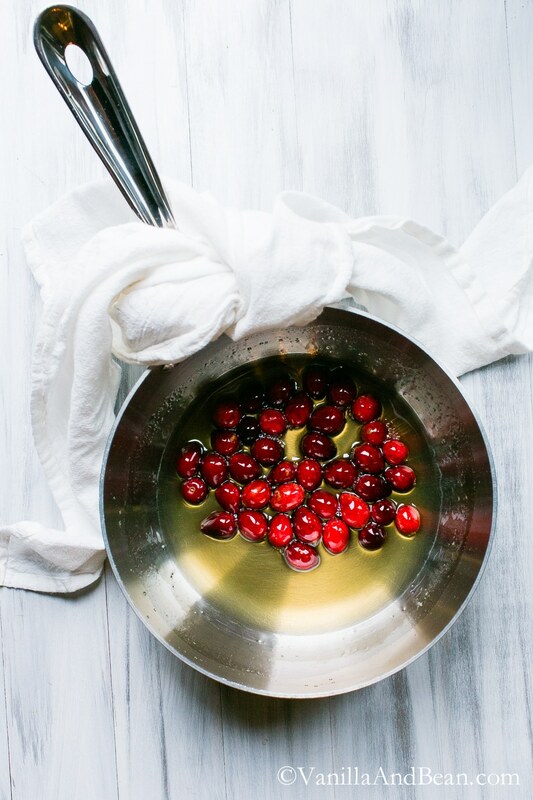 I’d love to hear your favorite cranberry sauce recipe! I want to like it… really. Share or drop a link in the comments. In a small sauce-pot, whisk water and 1/2 C (134g) of sugar to combine. Bring just to a simmer and whisk until sugar is dissolved. 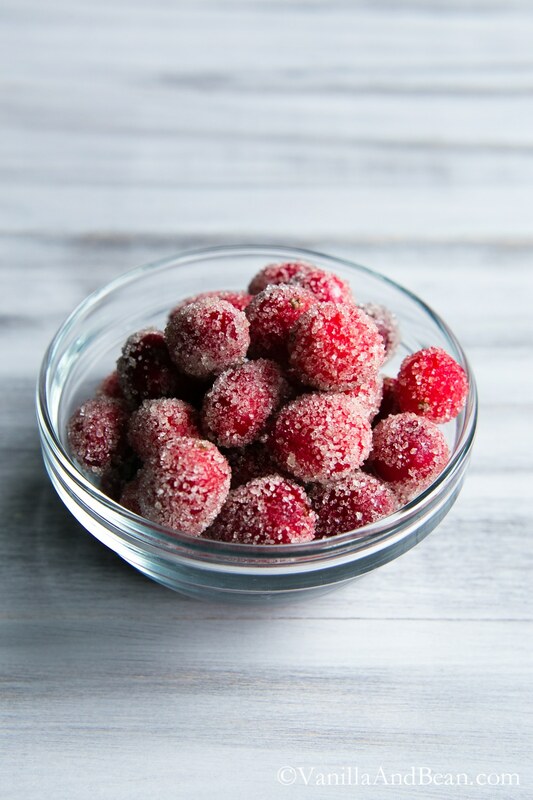 Remove from heat and stir in the cranberries so that they are coated evenly with the sugar syrup. Cover and let steep for 10 minutes. Strain, reserving the syrup*. 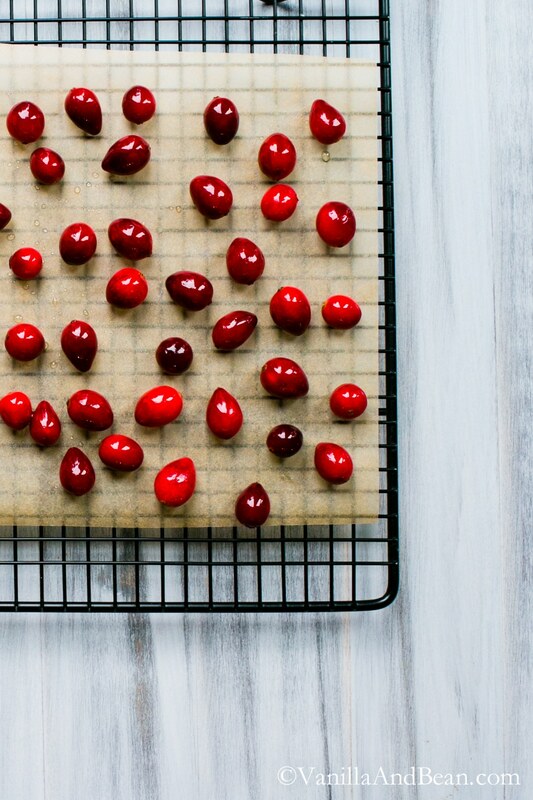 Separate the cranberries and place on a piece of parchment paper on a wire cooling rack. Allow to dry out for one hour. Place the remaining sugar on a plate and transfer the cranberries to the plate, rolling the cranberries in the sugar to coat. This is sticky, but as the cranberries get coated, they wont stick to your hands as much. Place the cranberries in a lidded container with a little bowl of rice. The rice helps keep the cranberries fresh by absorbing any moisture in the air. Sugar loves water and will pull it right out of the air making your cranberries soggy quicker than you'd prefer. It should stay fresh for two days, if they last that long! After two days, you'll notice the cranberries "weeping." To freshen them up again, simply toss them with sugar again. Reserve the sugar syrup for cocktails. I always use cane sugar but especially for this recipe. The grain size is larger which gives a nice sparkle affect to the cranberries. Hi There, I would like to use these as garnish for a drink and prepare in advance. Can I freeze these? Hi Marianne! I’ve not tried it but if frozen, you’d have to thaw them out to use. The cranberries would probably be mushy, and the sugar would absorb any surrounding moisture. You could try a few test cranberries though, prior to committing the whole batch if you want to give it a go. Thanks for the recipe. Sounds simple enough. Could you change the time needed though? It suggests 15 minutes but in the body you say you have to let the cranberries sit and cool for an hour. I was looking for a last minute garnish for a pie, and I was initially pleased to see only 15 minutes, then despondent to see 1 hour. Hi Metqa! Thank you for your note! So happy you enjoyed the cranberries. I’ve updated the top recipe notes to include the hands off time needed to dry the cranberries. Thank you again! Do you place the cranberries on top of the rice to store them? Hi Sue! They don’t need to be touching. I simply put the rice in a little pinch bowl and set it in the storage container with the Sugared crans. Hi! If I make these the night before my party, would I need to refrigerate them? With the rice? Hi Diane! No need to refrigerate. Store at room temperature with the rice, they’ll be fine. If they do soften a bit, just toss them with sugar again for a double coating – they’ll be even more sparkly! Enjoy! Can you use these to decorate hurricane with candles. 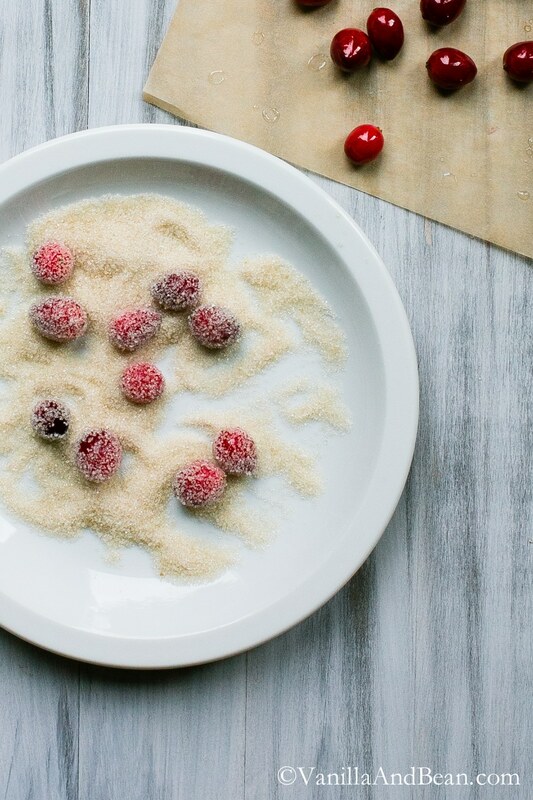 Hey Priscilla, thank you for your note… while I’ve not tried it, this link may be able to answer your question: https://www.pinterest.com/doximom55/decorating-with-cranberries/ Pinterest saves the day! I have a silly question. Store them with raw rice ? Does it matter brown or white ? Just started to read your blog. The pictures are beautiful. Tomorrow I’m going to make your Dutch Baby. I don’t mean to be critical – just was reading the above recipe and wanted to tell you that there is a small typo. You wrote Place instead of Plate. No big deal, but I did have to read it a couple of times. Can’t wait to peruse the rest of your site. Hi Ann. So sorry about that. Thank you for your note! I hope you enjoy the Dutch Baby! Love this… what a perfect cocktail garnish. Will definitely try this recipe soon! Thank you Dulcie! May I suggest this one? 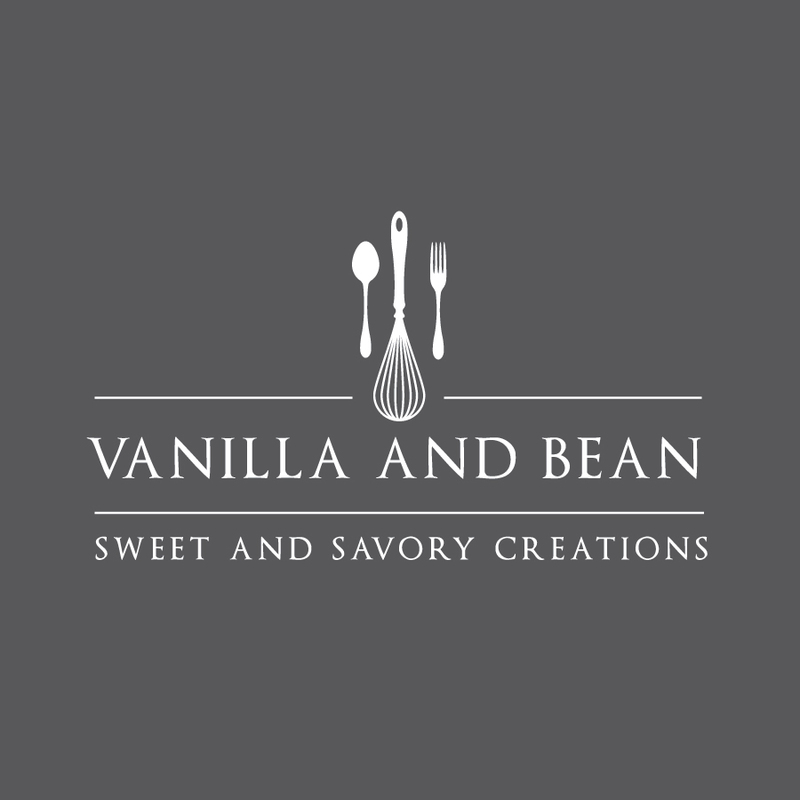 http://vanillaandbean.com/the-big-sister/ I hope you enjoy these tasty treats! So fun and gorgeous, Traci! Yes, would be so pretty on cakes, platters, and all things holiday! Beautiful photos as always! Couldn’t help adding a couple thoughts for cranberry sauce (or chutney) … I know it’s a subject from long ago but, hey what the heck. I always add a couple more fruits and a nut. Usually an Apple cored, chopped snall, peeled or not and blueberries (fresh or frozen)…along with fresh Orange juice and Zest… and Walnuts chopped. And I usually trade out some of the white sugar for brown sugar…and a pinch of salt with about a 1/4 tsp. Cinnamon. But last year I switched the blueberry for raspberry! YUM! We use this for wonderful turkey sandwiches with leftovers from Thanksgiving. Hope you find a sauce that works for you! And have fun experimenting. Hi Kenna! Thank you for your note and tips! I just made these to take as hostess gifts for Thanksgiving. They.are.so.good! I’m happy I had a few leftover; been popping them like candy! Saved the syrup and will be making those drinks for a birthday party on Satuday. Thanks for the great idea! I love cranberry sauce, bet I would love these, too! I am imagining them on a leafy salad with blue cheese and walnuts…or a fruit salad! And I agree with you about the cane sugar. Gorgeous! Oooooh…… Yesss, Deb!! What a great idea! Sweet, salty, tart crunch! I love it! What kind of dressing? Thank you my dear! I absolutely love cranberry sauce, but I also absolutely love sugared cranberries. 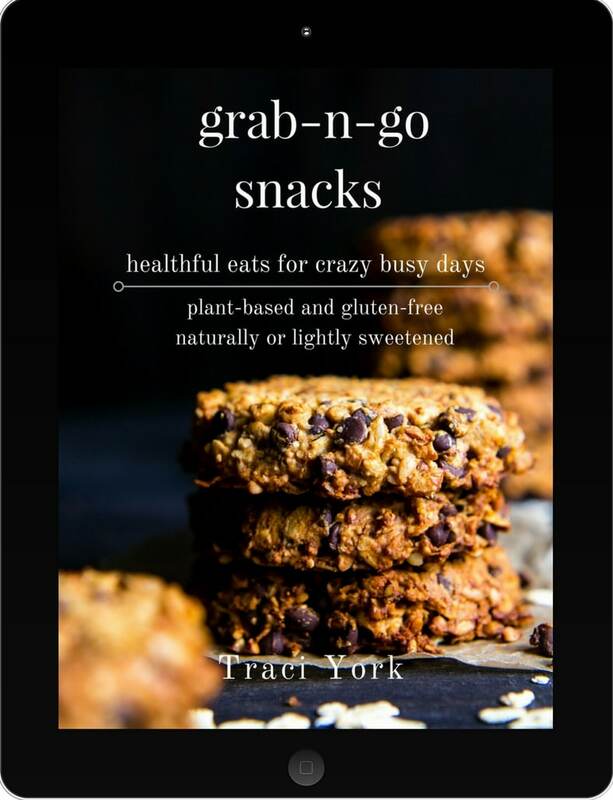 I guess I just generally love cranberries, full stop ;) Your pictures are so incredibly gorgeous Traci! I could stare at them forever. 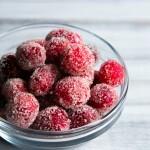 I have been wondering about these sugared cranberries. They are so pretty but I was worried they would be too tart – you have convinced me to try them! Also it is such a great idea to save the syrup for cocktails. I do like homemade cranberry sauce on Thanksgiving, I like the sweet and savory combo that you get by having just a little on your plate next to the turkey and stuffing. Plus, it is essential for the Day After Thanksgiving Sandwich! I make a super simple recipe with just some water, sugar, orange zest and cranberries. I know Meghan! I used to think that too until I gave em’ a go. They are still tart, but the sugar really balances out the sharpness. No doubt the day after Sandwich. Sometimes it seems that’s more on the brain than the actual feast! People love sandwiches! hehe. Yes, yessss!! They are Annie, and sooo easy. You’d love them! I did see your cranberry applesauce on IG! I’ll be checkin it out. The cinnamon and bright citrus sounds just fabulous! Thank you my dear! I have never made sugared cranberries, but they look so pretty and sound delicious. I will definitely give them a try Traci! Thanks for sharing and I hope you have a wonderful Thanksgiving! 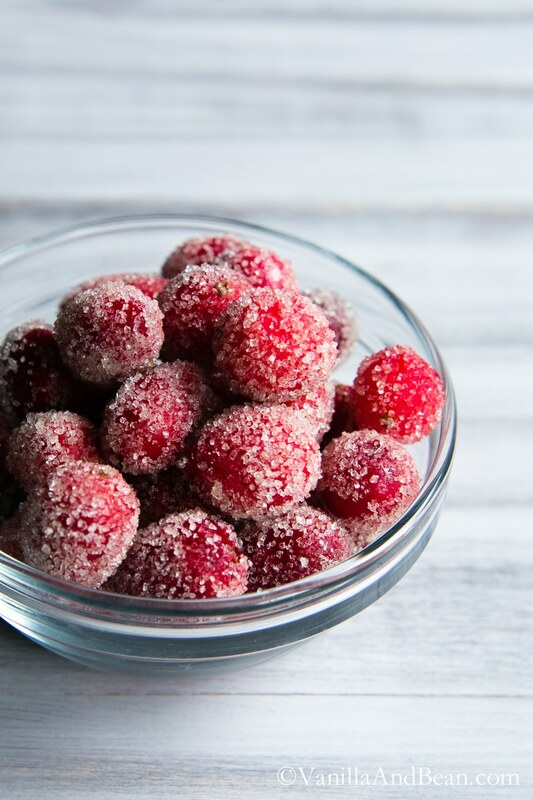 I’m not a huge cranberry sauce fan either but these sugared cranberries treats look lovely – the sweetness of the sugar and the tartness of the cranberries sound like a perfect combination. I love the idea of pairing them with cocktails! Your photos, as always, are gorgeous. Have a wonderful Thanksgiving, Traci!